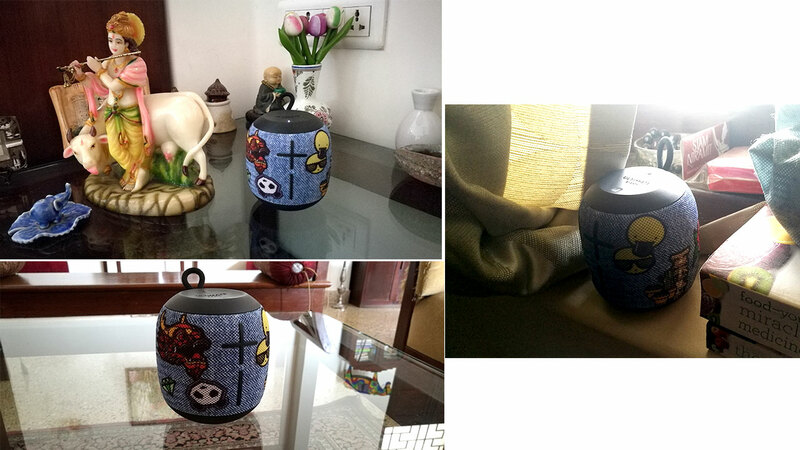 The product that we received has a funky styling to it compared to the rest of the line-up. UE Wonderboom's sound varies more since it depends on where you place it. If you are not kicked about that, go for the JBL Flip 3. Ultimate Ears known for its custom-made in-ear earphones started to branch out into other products such as Bluetooth speakers, after consumer peripheral giant Logitech bought it back in 2008. 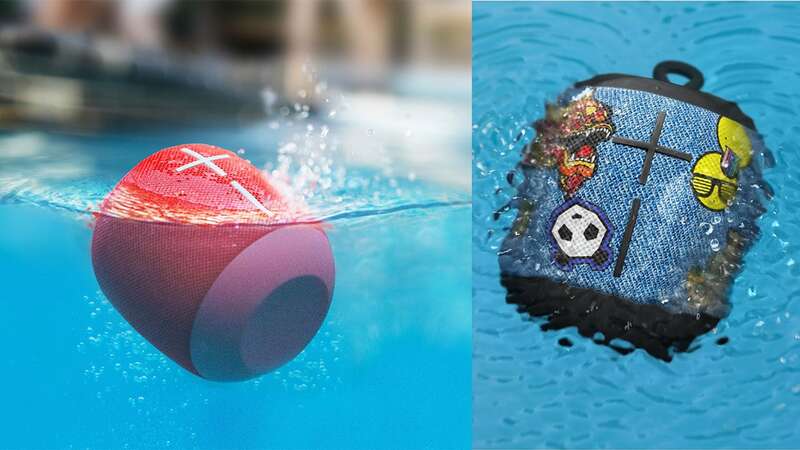 Today we review their funky and ruggedly styled UE Wonderboom Bluetooth speaker that boasts waterproof technology and 360-degree sound. 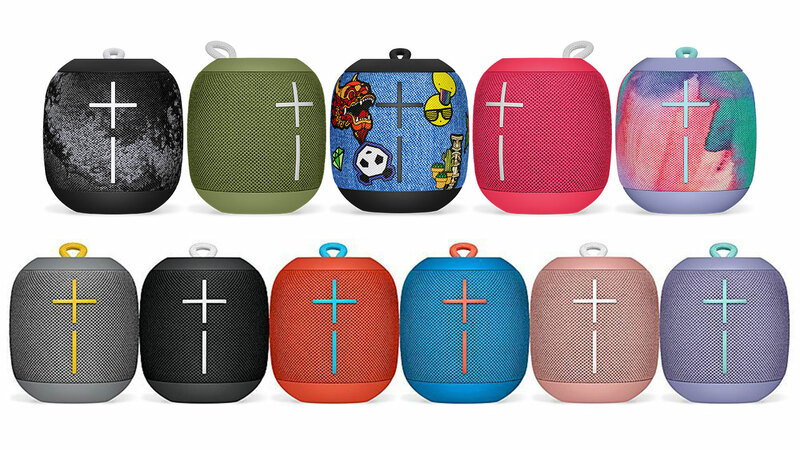 The Ultimate Ears (UE) Wonderboom that we received has a funky styling to it compared to the rest of the line-up which actually makes this speaker stand out a lot more. The colours and styling range is incredible. The speaker is incredibly sturdy and built to last. The rubberised exterior is tightly woven with the fabric-like speaker grill which ensures that neither dust nor water can enter the speaker. The speaker is IP67 certified meaning it can stay in 1 metre of water for up to 30 minutes. 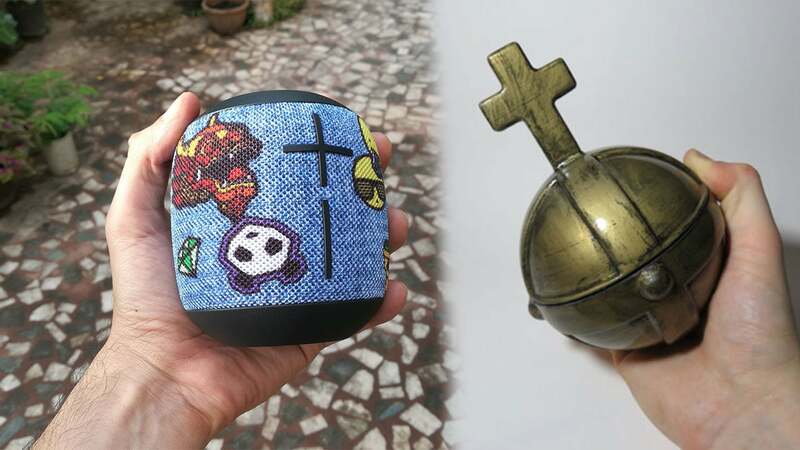 Is that a speaker or a holy hand grenade? Image: Etsy. The big “plus” and “minus” buttons aren’t just for style. The buttons are really cleverly placed on the speaker, the stylish oversized volume up and down on the front and the hidden buttons on the top. All that you need to know about UE Wonderboom. There are actually not two but three buttons on the top to sync Bluetooth, Power on/off and the “Ultimate Ears” text itself is a button that lets one pause/skip or Double Up with another speaker. The “Double Up” is a feature for adding another UE speaker to the setup, it doesn’t make the sound stereo but actually doubles up with another speaker for more sound. 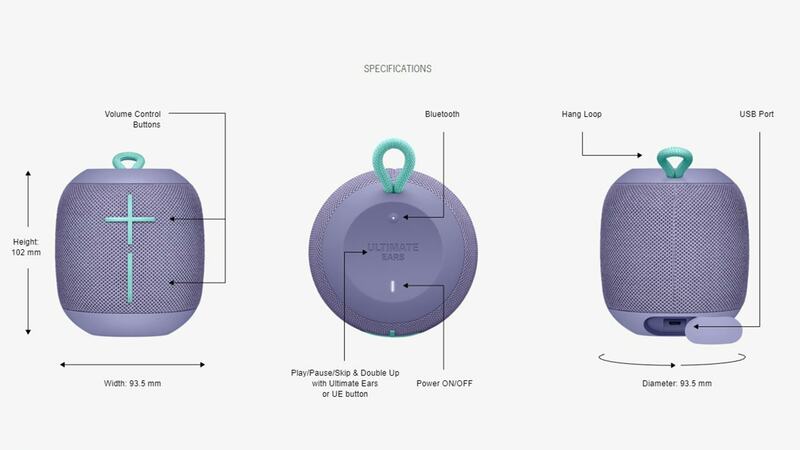 In the box, you get the speaker and a micro-USB cable, that’s right UE Wonderboom hasn’t adopted the USB-C standard as yet. The performance of the Ultimate Ears Wonderboom speaker is good overall, and yet at the same time, the sound quality is quite a mix bag depending on where you play it. For its size, the speaker is deceptively clear, with clear highs and mids, and punchy bass. You will not hear muddiness nor screechy sounds which speakers of this range generally exhibit especially at high volumes. The speaker, however, does do this with some clever tricks. While the speaker specifications say frequency range of 80 Hz to 20 kHz, the speaker appears to give lower bass. It does this because it is designed to reflect sound off surfaces which helps it achieve a sound that it cannot by its own two tiny 40 mm active drivers and two passive radiators alone. Therefore advertised as “360-degree sound”. The UE Wonderboom sound varies immensely, in a corner (left), on the table (bottom), on the windowsill (right). What this means is, when UE Wonderboom is placed in a corner, by a window sill, near a sofa, on the bed, the sound would become bassy/boomy and louder due to the several surfaces such as walls, sound absorbent material such as sofa or bed fabric. But as soon as it is placed on the table, the wonderful bass was lost, the sound lost its body. “But this is true of any speaker”, you might say? 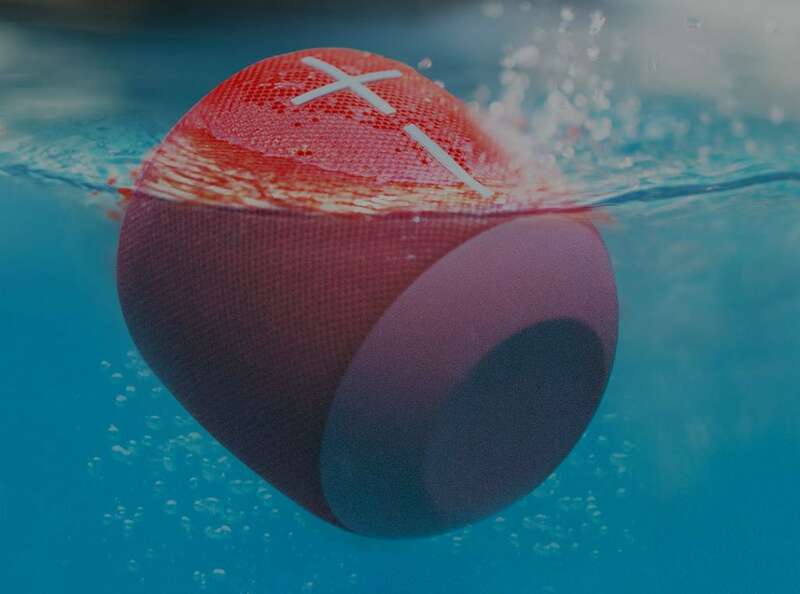 And that is correct to a certain extent, but even more so for the UE Wonderboom’s design. Due to the way the speaker is shaped, it is not made to give a front directional sound experience but rather a 360 degree sound which means it aims at sound reflection primarily. Therefore if you were the sole listener and wanted to hear a video with voice dialogue in it, you’d not be able to get a straight sound out of it nor be able to hear highs of a song directly, it would sound as if it is coming from a different place. While this is certainly is a feature, it did get a bit disorienting for me when I wanted to hear keen dialogues of a YouTube clip. When it came to music it made sense to reflect it off the best surfaces or angled spaces I could find, it made a world of difference to listening to music when doing something else as you aren’t in the line-of-sight of the speakers when moving about. The speaker is perfectly happy in the shower when playing the tunes, though your phone wouldn’t be as much with the moisture. When playing music directly underwater, expect the music to change from clear to bassy sound as the water absorbs a lot of sound. Underwater is a nice feature to have but don’t count on it. UE Wonderboom oddly doesn’t support phone calls. I was honestly surprised when I tried to make a call or two, thinking it was a configuration error or mistake on my behalf. That being said, honestly I do not know of people who like to use call support from a Bluetooth speaker, as it isn’t the best way to talk on the phone unless you are in a closed room without any noise. The battery is rated to last about 10 hours; depending on the volume you can expect it to last anywhere between 8 to 10 hours of playback. The Ultimate Ears Wonderboom is a good speaker for the sound, the incredible built quality and styling. The MRP is Rs 7,995 with a street price of around Rs 6,000 makes it a compelling buy. For this price, waterproof feature and audio performance JBL Flip 3 is equivalently good. Personally, I’d prefer JBL Flip 3 over the UE Wonderboom primarily for the reason that Wonderboom’s sound varies more than I like depending on where it's placed. 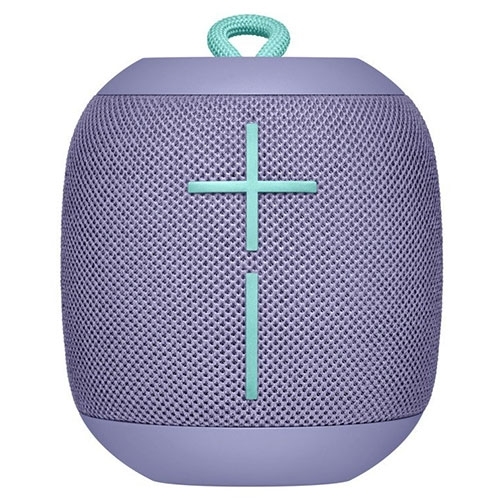 The Flip 3 (and most Bluetooth speakers) on the other hand have front-firing speakers and aren’t as dependent on reflecting surfaces as the Wonderboom is to belt out the sound.